Flying is easy for everyone. Double tap the screen to fly. An Obstacle Sensing System keeps the Phantom safe as it goes, and Smart Return Home returns it to you more safely. ActiveTrack lets you track a subject automatically, no band or beacon required, with obstacle avoidance keeping the Phantom clear of objects. Moving POI lets everyone shoot previously impossible shots. Advanced propulsion systems, highly integrated and more streamlined design combined with a larger capacity battery gives the new Phantom 25% more effective flying time. A brand new Sport mode brings responsive controls and the thrill of speed everywhere. An integrated gimbal and new battery positioned to move the center of gravity close to the aircraft’s core combines with raised motors that increase torque reaction, and a reliable flight control system which precisely controls the aircraft’s movement to make flight at high speeds safer. Advanced aerodynamics and stability Sleek, streamlined aerodynamics help the Phantom 4 slip more smoothly through the air. An integrated gimbal and camera raises the center of gravity for more airborne stability. 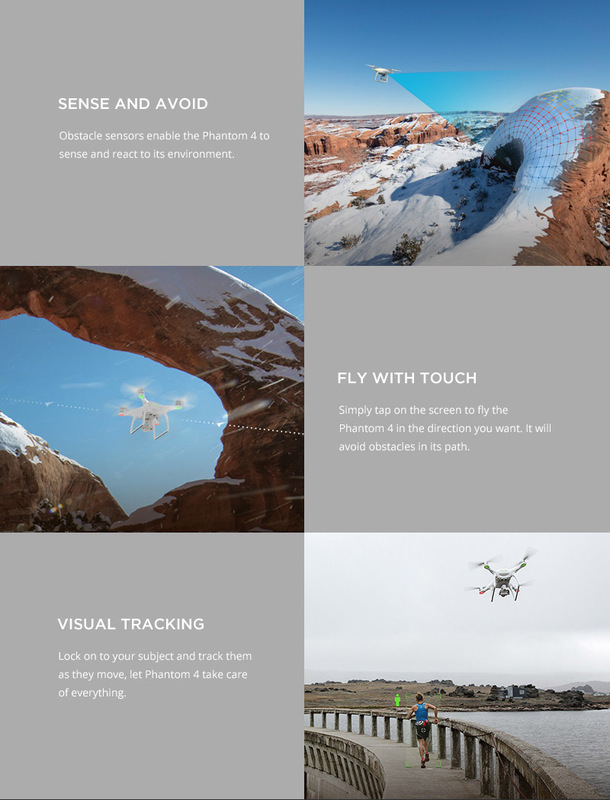 ï¬ Multiple Flight Modes Switching flight modes to meet your needs, whether you are looking for simplicity and intelligent navigation, speed or smooth cinematic movements is easy. ï¬ Fly Far for Longer Fly for 28 minutes*, an increase in effective flight time of 25% from the Phantom 3 Professional. Enjoy 3.1mi (5km)** of range, with complete control and a live 720p HD view of everything the camera sees. *In calm conditions with constant speed. **Maximum range tested in unobstructed areas free of interference and may vary depending on local regulations. greater security and confidence when flying indoors. High Performance Camera Shoot sharp, clean video in up to 4K at 30fps and Full HD 1080p at 120fps for slow motion, through a newly designed lens that dramatically increases sharpness. ï¬ Professional Post Production A range of video color profiles are available to help you get the look you want easily, from bright vibrant colors to professional flat profiles including D-Log and Cine-D that are ready for video post-production. Photographers can shoot images in 12 megapixel Adobe DNG RAW. ï¬ Integrated Gimbal An advanced 3-axis gimbal takes out unwanted vibration and movement in-flight, enabling the camera to capture smooth and fluid footage even during complex maneuvers. Intelligent Flight Positioning The Phantom 4 connects to both GPS and GLONASS, allowing it to connect to satellites faster and position itself with extreme accuracy in the air. ï¬ Automatic Flight Logs The Phantom 4 automatically logs the details of every flight you take so you can check back on previous flights. Built-in Redundancies Dual compass modules and dual Inertial Measurement Units (IMUs) allow the Phantom 4 to constantly check the data it is receiving. This means any incorrect data can be isolated and ignored without ever affecting your flight. Beginner Mode Beginner flyers should build confidence by flying low and close. Beginner mode prevents new pilots from going beyond their skills. An adjustable maximum height and distance can also be set when flying skills improve. DJI GO is all you need to fly, create, share, and connect. Compatible with the Phantom series, Inspire series, Osmo and more. 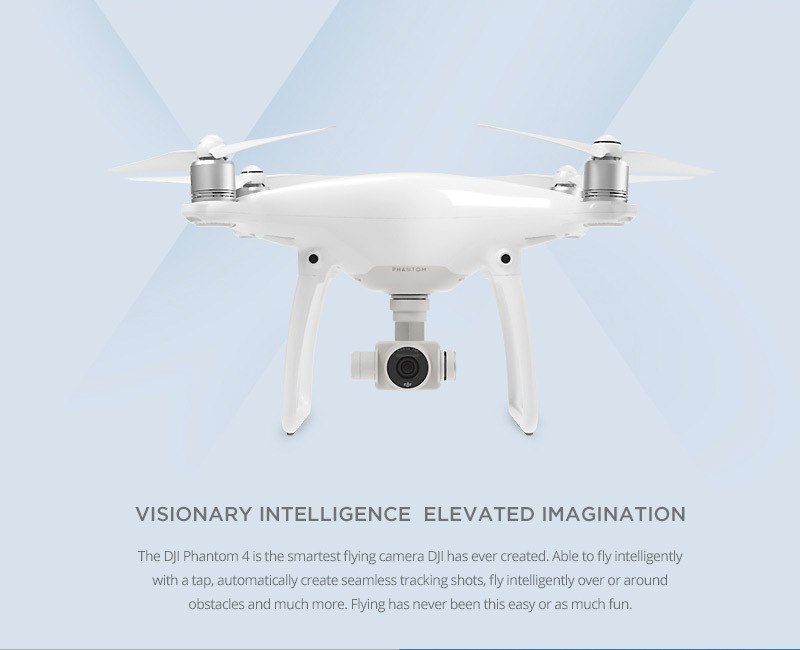 ï¬ SDK Supported Through the DJI SDK, the Phantom 4 open to software and hardware development. ActiveTrack allows an aircraft to track a moving subject without a separate GPS tracker. Simply tap on the mobile device screen inside the DJI GO app to select the subject to be tracked. The aircraft will lock on the subject and start tracking it automatically from a safe distance. TapFly means you can fly in any direction with a tap of the finger, without a remote controller. With Obstacle Avoidance turned on, the aircraft will automatically avoid obstacles, slow down or hover when required, provided that the scene is bright enough ( < 300 lux) or too bright ( > 10,000 lux). What is the Phantom 4 Obstacle Sensing System? The Phantom 4 is equipped with an Obstacle Sensing System that constantly scans for obstacles in front of it, allowing it to avoid collisions by going around, over or hovering. Why does the Phantom 4 have a composite core? The advanced composite core embedded into the aircraft greatly increases rigidity, minimizing unwanted vibrations. This ensures the precision and performance of the inertial measurement unit (IMU). The weight of the aircraft is also reduced through this composite. What changes were made to the Phantom 4 remote? A (Attitude) Mode remains the same and removes satellite stabilization in flight. It allows the Phantom to move more smoothly and naturally. The ‘Playback’ button on the top right of the remote controller has been changed into a ‘Pause’ button that lets you put the Phantom into hover during any Intelligent Flight Mode, ActiveTrack or TapFly with a tap. What improvements have been made to the Phantom 4 Vision Positioning Unit? The Vision Positioning System now uses four sensors to increase hovering accuracy and reliability, creating a more controlled flying experience. Its sonar system has been improved and now functions from up to 10 meters off the ground. In ideal situations, these combine to give the Phantom 4 Vision Positioning System a vertical hover accuracy of +/- 0.1 m and a horizontal hover accuracy of +/- 0.3 m.
What is the effective range of the Obstacle Sensing System on Phantom 4? The effective range of the Obstacle Sensing System is 0.7 to 15 meters. Although the DJI GO app will indicate when there are obstacles present, pilots should always be paying attention to the aircraft during flight. Does Obstacle Sensing System work in all modes? The Obstacle Sensing System can be enabled in ActiveTrack, TapFly, Normal mode and all Intelligent Navigation functions. What are the major improvements in the Phantom 4 propulsion system? The motor on the Phantom 4 is designed to work with the latest Push-and-Release Propellers. With this locking mechanism, propellers can withstand drastic changes of motor speed, allowing the aircraft to be more agile and more responsive to the pilot command. How long does the Phantom 4 using the new Intelligent Battery? At sea level in calm environments when flying in Atti mode, the Phantom 4 can achieve 28 minute flight times. This will vary due to different flight patterns, weather conditions and altitudes. What are the major differences between the Phantom 4 propellers and the Phantom 3 ones? The new Push-and-Release propellers are faster to install and more secure than the Self Tightening propellers used previously. This security allows them to handle faster acceleration and harder braking. What makes the Phantom 4 gimbal better? What makes the Phantom 4 camera better? The Phantom 4 camera has been improved in terms of image quality. Chromatic aberration has been reduced by 56% and lens distortion had been reduced by 36% compared to Phantom 3 Professional. In addition to lens improvements, camera firmware has been tweaked to enable the camera to capture 120fps video in full 1080p FHD (the camera’s field of view will be reconfigured to 47Â° when recording in this mode) for smooth slow motion. The camera is also used for ActiveTrack and TapFly modes. Why add a redundant IMU and compass to the Phantom 4? A redundant IMU and compass enhances system reliability. The Phantom 4 can constantly compare data received from both IMUs and then navigate itself using the most accurate data. The same is true of the redundant compasses. What are the highlights of the Phantom 4 remote control and live feed? The Phantom 4’s remote control and live feed is based on DJI Lightbridge technology, providing effective control range of up to 3.1mi (5km) in unobstructed areas that are free from interference. Its HD live feed gives you an exact view of your flight, perfect for composing shots. Does the Phantom 4 have Return-to-Home? Yes. It also has Smart Return Home which engages the Obstacle Sensing System during return to home flight. If the aircraft sees an obstacle on its way back, it will intelligently avoid it as it comes home. What’s the purpose of the Sport Mode? Giving a top speed of 44.7mph (72Kph), Sport mode can be used for fun, letting you fly faster than ever, or to get to your shoot location while the light is perfect. What’s the horizontal speed of Phantom 4 in Atti Mode? The horizontal speed of the Phantom 4 in Atti mode is 35.8mph (57.6kph). What is the difference between Sport Mode and Atti Mode? 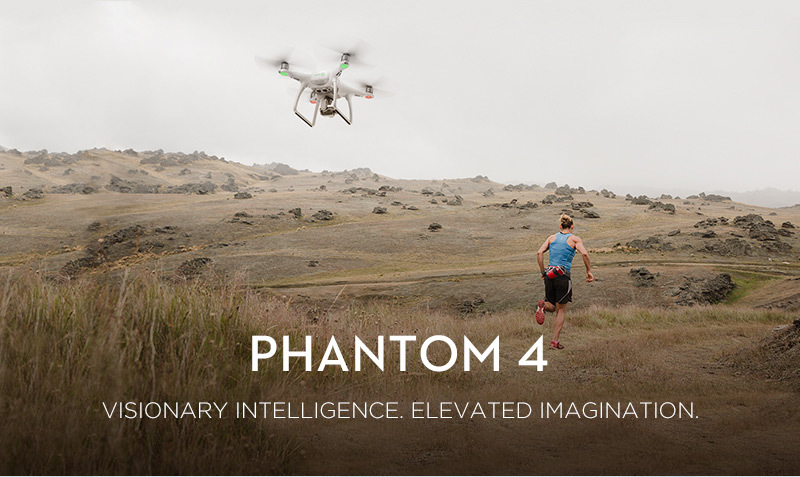 Phantom 4 can fly up to 44.7mph in Sport Mode while in ATTI Mode it can fly up to 35.8mph. Phantom 4 will use GPS/Glonass and its Vision Positioning System to achieve precision while hovering. In ATTI Mode, GPS and Vision Positioning System will not function to aid the aircraft in terms of hovering or navigation. In ActiveTrack, how do you untrack the subject? What happens to the aircraft after you stop tracking? Tap the Stop button on the left of the screen or pull the pitch stick backward for 3 seconds to exit ActiveTrack. After exiting, the aircraft will hover in place. At this point you may choose to start a new mission or bring the aircraft back to the Home Point. How small an object can the Obstacle Sensing System see? The minimum pixel size that the Obstacle Sensing system can see is 500 pixels. What is ActiveTrack’s minimum altitude? ActiveTrack will work down to 6ft (2m) above the ground when the aircraft is switched to P mode. lly from a safe distance.